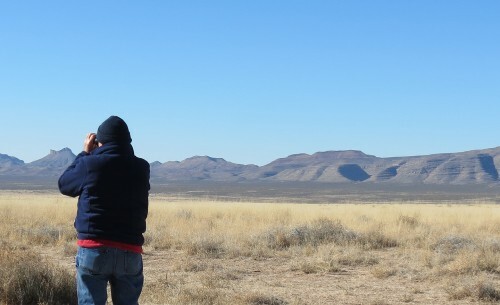 The Desert in Winter /Hawks Aloft Inc.
Twenty years ago, we began doing raptor surveys of the Rio Grande and Estancia Valleys, monitoring during the months that raptors are resident, summer and winter. I am fortunate to survey the desert grasslands of the Armendaris Ranch, owned by Ted Turner. 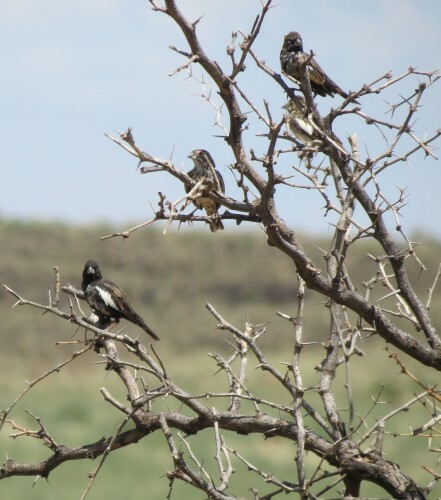 It’s one of the largest privately owned ranches in New Mexico and stewardship of the fragile environment is a priority. 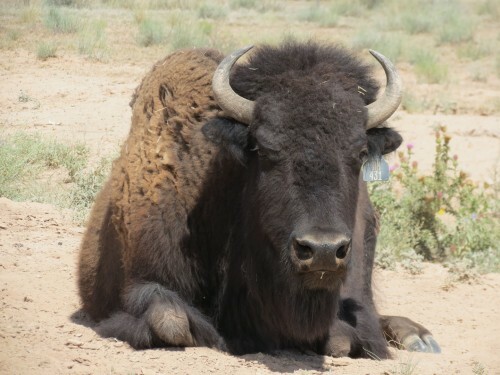 They raise bison on the expansive ranch, but mostly there is little evidence that this land is grazed by anything other than wildlife. The grasses are tall and golden at this time of the year, as well as abundant. In many areas on the ranch, you could fool yourself that you were in a pristine environment, except for the road, of course. Along with my survey partner, Chuck Brandt, we survey a 20 mile stretch of the ranch on the main ranch road. At each of 20 stops, we scan 360 degrees in search of raptors, Loggerhead Shrikes, and Greater Roadrunners. With the high pressure system riding high over the West, the temperatures last week were positively balmy with relatively light winds. 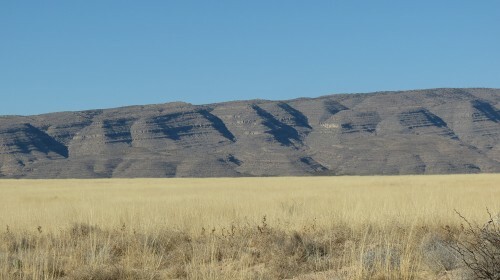 Playa at the Armendaris Ranch, a full month after the last precipitation. We haven’t had any rain in nearly 40 days, but when it does rain in the desert, it can be substantial. 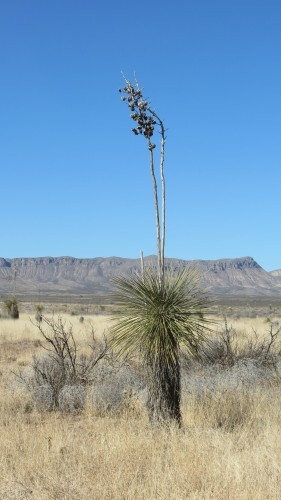 Such was the case in late November, when the ranch received significant snow that closed the main ranch road and filled the playas. Now, in mid-January, the playas still held bounteous water. 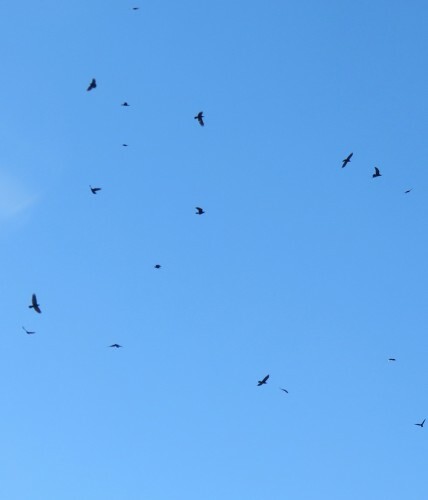 Chihuahuan Ravens were in abundance as we arrived, riding the winds in multiple kettles of up to 50 birds. 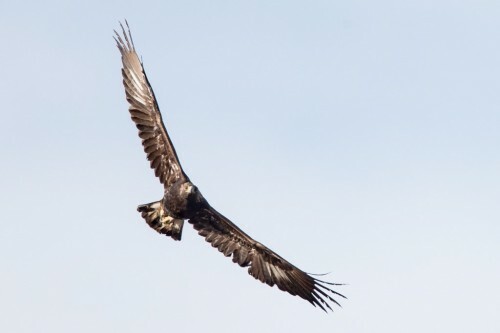 Chuck commented that, in his experience, the presence of loads of ravens boded poorly for raptor numbers. But, to our surprise, we started off with at least one bird at every early stop. But . 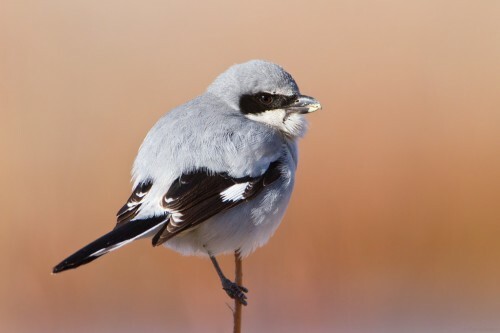 . .
most of them were Loggerhead Shrikes, also known as butcherbirds, for their hunting habits. They capture live prey and impale it on thorns and barbs to be consumed later. In all, we tallied 12 Loggerhead Shrikes on this survey. Also present were Lark Buntings, seen in huge flocks of a hundred or more. Watching these flocks with their unique flight styles foraging on the roads and nearby shrubs is thrilling as they undulate in almost coordinated flight. Of course, the other songbird present in large numbers was the Horned Lark. But, the highlight of the day was sighting three individual Golden Eagles, not a common sight, so seeing three in one day was thrilling, even though the birds were distant. We also counted Prairie Falcon, American Kestrel, Red-tailed Hawk, and Ferruginous Hawk. It is clear that the management practices of the Armendaris Ranch benefit raptors and their prey! Some folks have difficulty in finding much to appreciate in the desert at any time of year but, for me, it bespeaks unsurpassed beauty in nature.